As the rain showers moved away, the clearing skies put on a beautiful show of sunlight and shadow. 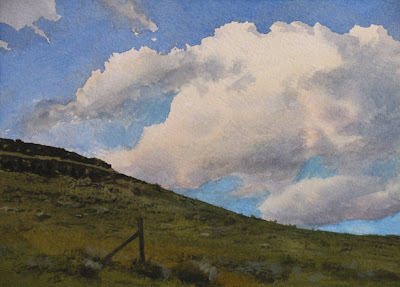 Don, I love the clouds in these two recent works. Reminds me of why I love watercolor so much! Hi Don--thanks! Great little caricatures you're painting. Wow....wish I could have seen that for real....though you did capture it so that I would even get the idea of being there! Love the swoop of the hill, Don. Hi Jason--many thanks. I've been enjoying your Montana paintings.